How many times in our life are we at a crossroads not knowing what to do or where to turn. If God seems distant we have assurance through the word of how He really does hear us in times of need. We know of the pain and suffering our Lord suffered on the cross, yet God heard Him at His darkest hour! (Psalm 22:16-18,23,24) For dogs have compassed me: the assembly of the wicked have inclosed me: they pierced my hands and my feet. I may tell all my bones: they look and stare upon me. They part my garments among them, and cast lots upon my vesture. Ye that fear the Lord, praise him; all ye the seed of Jacob, glorify him; and fear him, all ye the seed of Israel. For he hath not despised nor abhorred the affliction of the afflicted; neither hath he hid his face from him; but when he cried unto him, he heard………. (Hebrews 5:7-9). 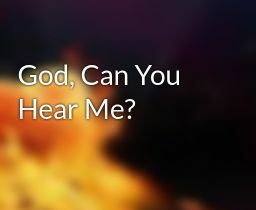 The fear of the Lord is a vital component of His hearing us, for He is a God we are to give reverence to. (Psalm 34:4-7). Solomon had the Lord appear to him and was told his prayer was heard, and the message given him at that time is also for us today that if we humble ourselves and turn from wickedness then we too will hear from heaven! (2 Chronicles 7:12-14). And the Lord appeared to Solomon by night, and said unto him, I have heard thy prayer, and have chosen this place to myself for an house of sacrifice. If I shut up heaven that there be no rain, or if I command the locusts to devour the land, or if I send pestilence among my people; If my people, which are called by my name, shall humble themselves, and pray, and seek my face, and turn from their wicked ways; then will I hear from heaven, and will forgive their sin, and will heal their land. It is written when the righteous cry the Lord hears them and they are delivered out of all their troubles. (Psalm 34:17-19). The righteous cry, and the Lord heareth, and delivereth them out of all their troubles. The Lord is nigh unto them that are of a broken heart; and saveth such as be of a contrite spirit. Many are the afflictions of the righteous: but the Lord delivereth him out of them all.